Lihue, Kauai, Hawaii – Marriott Golf, one of the world’s biggest golf operators, recently debuted the elevated Kiele golf experience at Kauai Lagoons Golf Club with the much anticipated re-opening of the Kiele Moana Nine, featuring the longest continuous stretch of ocean holes on any course in Hawaii. 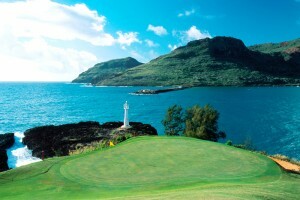 Kauai Lagoons Golf Club is a premier 27-hole facility recognized by Condé Nast Traveler as one of the Top 125 Golf Resorts in the U.S. in the April 2011 issue. Designed by the legendary Jack Nicklaus, the renovated Kiele Moana Nine (formerly the Kiele Course back 9) received extensive upgrades including the addition of three new holes, more consistent TifEagle putting surfaces, white silica sand bunkers, and is highlighted by dramatic ocean views offering a spectacular run of ocean holes that stretch more than half a mile. The Kiele Moana Nine will be paired with the Kiele Mauka Nine (the original Kiele front 9), creating a signature 18-hole Jack Nicklaus Championship Kiele golf experience. “The Kiele golf experience is legendary for locals and visitors to Hawaii, and we are thrilled to introduce an inspired layout that will make the experience even more memorable,” said Bill Nault, Vice President, Marriott Golf. The Kiele Moana Nine represents the first of three revitalization phases for Kauai Lagoons Golf Club, which will also include the Kiele Mauka Nine (former Kiele front 9) and the Kiele Waikahe Nine (comprised of the best 9 holes from the former Mokihana Course). All renovated holes will feature new TifEagle putting surfaces, providing smoother putting conditions, and aesthetically pleasing white silica sand bunkers. The elevated Kiele golf experience comes on the heels of a $50 million transformation that touched all hotel areas of the oceanfront Kauai Marriott Resort on Kalapaki Beach. The resort offers a contemporary look and feel with upgrades to all 356 guestrooms and suites, a redesigned Kukui’s Restaurant and Toro-Tei sushi bar, and a new keiki (children’s) swimming pool with water spout features and a slide, complementing the resort’s 26,000-square-foot pool, the largest single-level pool in Hawaii. Additional on-site accommodations include Marriott’s Kauai Beach Club co-located with the Kauai Marriott Resort, as well as Marriott Vacation Club’s newest resort on Kauai, Marriott’s Kauai Lagoons. To complement the debut of the Kiele golf experience, Kauai Lagoons Golf Club and the oceanfront Kauai Marriott Resort on Kalapaki Beach are offering the “Escape to a Great Golf Getaway” package at this extraordinary golf resort. The package is valid through October 6, 2011, and a minimum 2-night stay is required. Marriott Golf manages 60 golf courses at 44 locations in 12 countries, offering more than 1,000 holes of championship golf. Marriott has been managing golf operations since 1970 and is one of the world’s premier golf operators.